Whether it’s medium to dark or red-brown to ginger, there is no doubt that any shade of auburn hair color is a serious head turner. This particular shade of red hair is popular because it’s flattering to a variety of skin tones and eye colors. Take a peep at our collection of light to dark auburn hair colors to inspire your next visit to the salon! 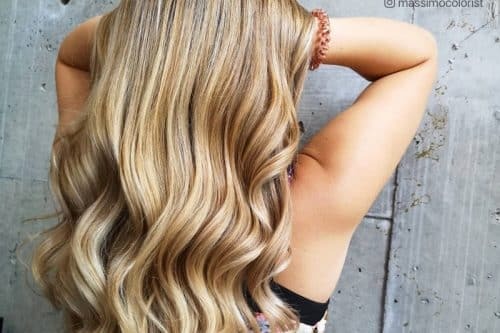 A rich flattering color can do wonders for thick long textured hair. 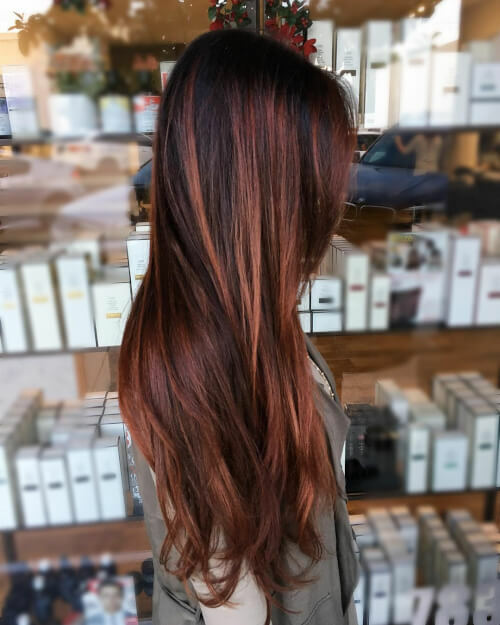 This burnt sienna with orange undertones can greatly intensify even the most subtle waves your hair has. 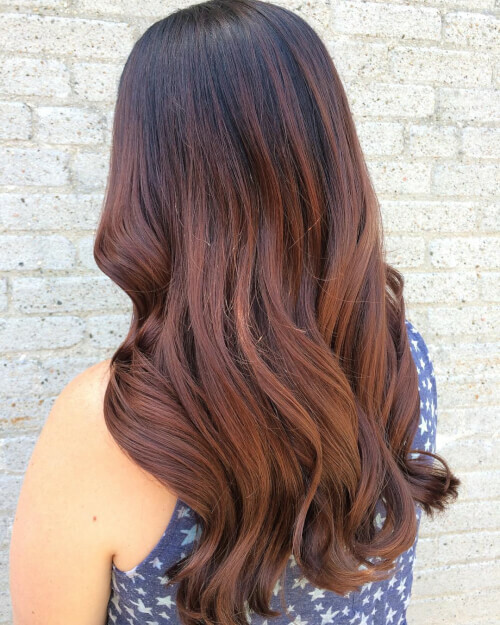 A dimensional reddish brown on long waves like this beautifully complements pale skin tones. It’s also a perfect start off point when you want to try the redhead lifestyle. This remarkable hue is a blend of medium brown and golden honey highlights that flatters those with warm undertones. Pair with flirty and light waves for that extra glam! The easiest way to become a natural brunette is to wear mixed shades of red brown hair like hers. Undoubtedly beautiful on any hair length and style, this shade also complements any skin color. 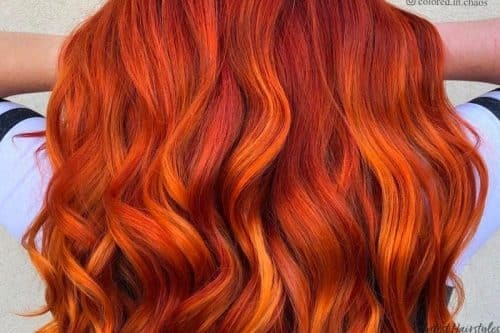 This deep shade of auburn would make anyone want to grow a long hair! 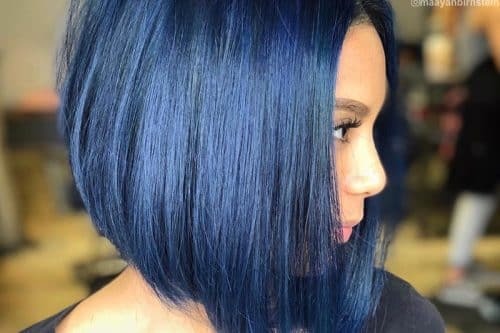 It’s a color that absolutely looks so mesmerizing with any style you try with your hair. 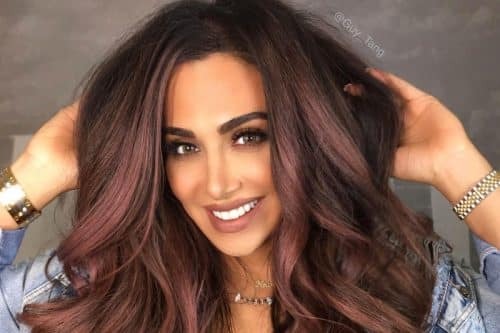 If you want to keep your beautiful natural brunette hair and spice your hairstyle up at the same time, try adding some auburn highlights to enhance your hair color and make it bright and vibrant! 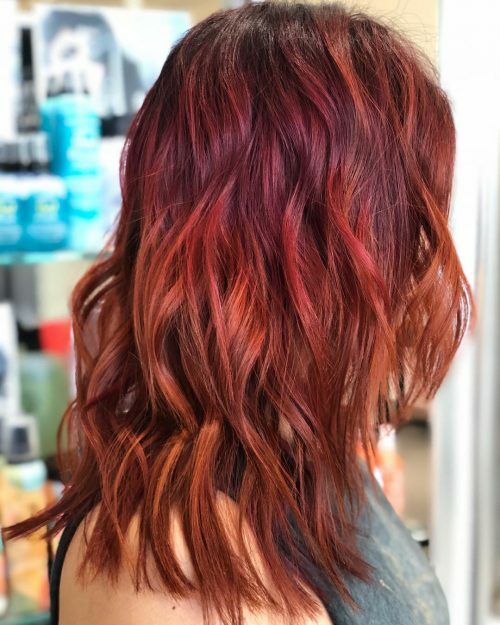 A dynamic triple melt with a bit of red, copper and purple to make this unique auburn red hair color. 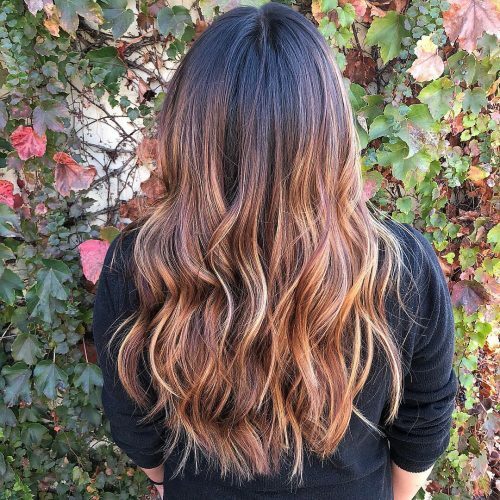 Autumn inspired auburn ombre hair color that melts into warm blonde tones. 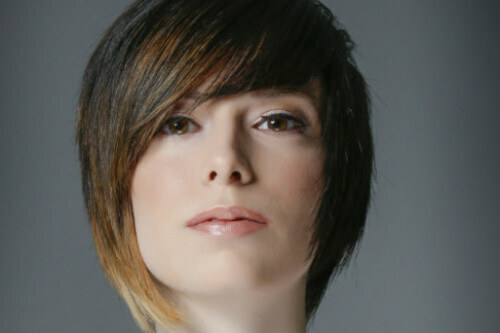 This gorgeous dark auburn hair with highlights features a dimensional bob cut. 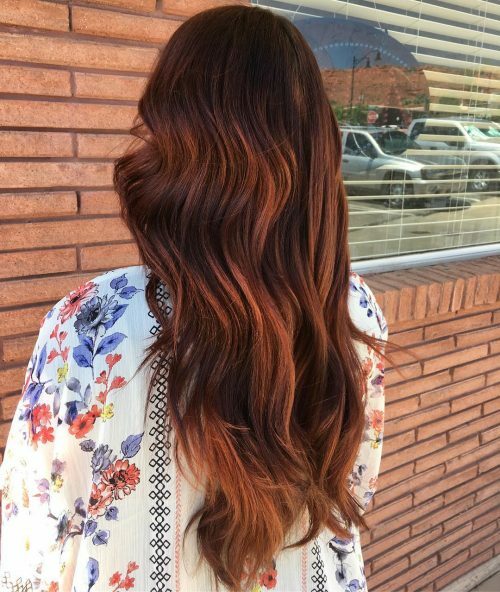 A gorgeous long, dark brown hair with auburn highlights like this adds so much richness to your color and look! 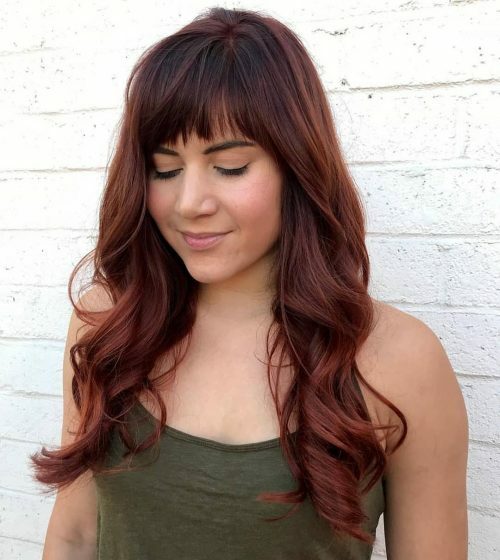 Gorgeous long hair with bangs and a deep auburn red hue. A honeycomb inspired auburn hair with caramel highlights. This color is a high depth copper balayage. I purposely used a rich brown base color to balance out the warmth of the copper mid-lengths and ends. 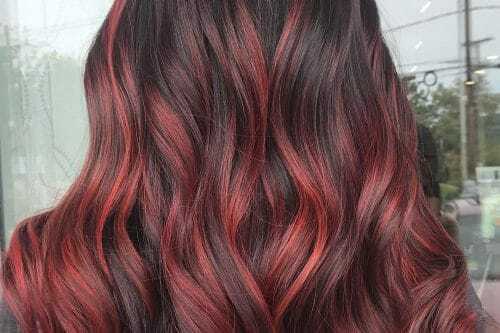 I love a good redhead and this look to me, with its vibrant color and soft wave, is very bold yet fun. My favorite thing about the look is how dimensional it is, creating the illusion of thicker, fuller hair. 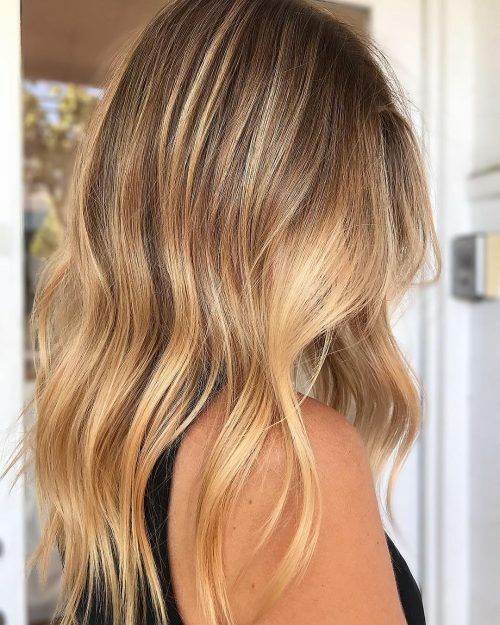 For someone considering an auburn balayage like this one, you have to be able to follow a couple of guidelines if you want a longer lasting color. The first of those being you need to be able to go 2-3+ days in between washes. In my experience, reds tend to fade a little faster than more neutral colors and prolonging washes helps extend color vibrancy. The second guideline is cooling your water down when washing and using a good color protecting shampoo and conditioner, like the Kérastase Reflection line. Another note of importance is knowing what colors complement your skin tone. Red coppers aren’t always right for everyone! 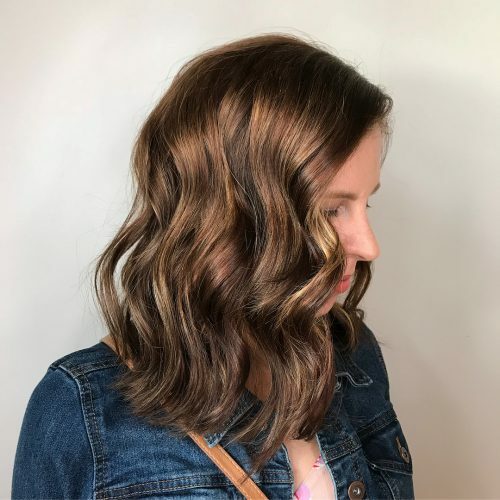 As far as styling goes, I love a soft wave to complement the depths of my balayage. I style using Oribe Soft Laquer before applying heat on dry hair and finish with Oribe Dry Texturizing Spray to add some extra body and movement. 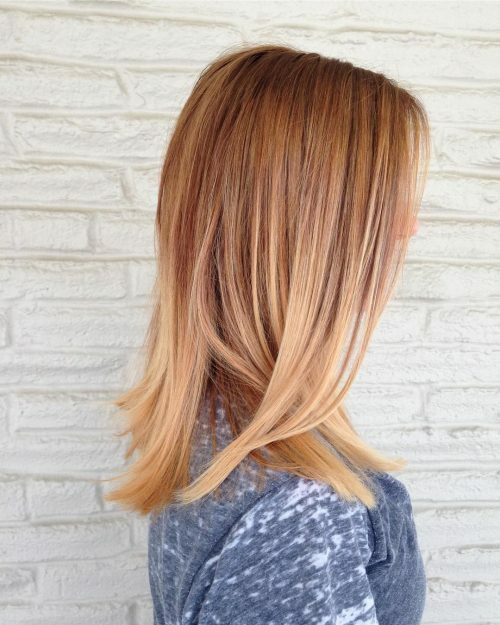 This color is a sunny, textured balayage. My favorite thing about it is the dimension between the high and low lights and the “worn-in” root. It reminds me of a warm summer glow. Wear it tousled using a sea texture cream for piecey texture! A bit of bronzer on the collar bone will also complement the sunny blonde tones. For this look, we did a blend of auburn and golden blonde balayage highlights. 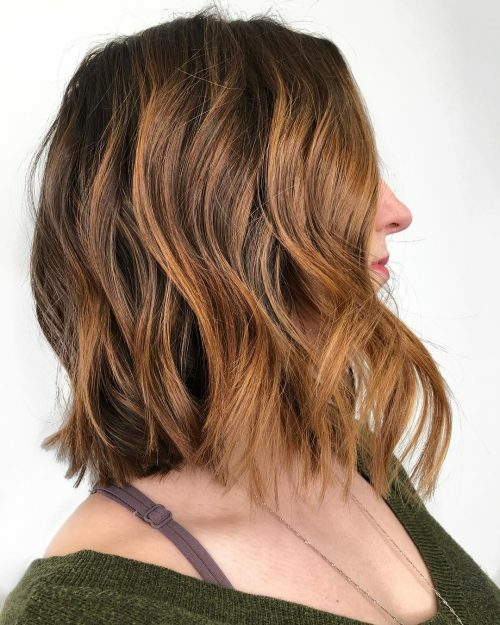 I used a “V” shape balayage technique and purposely kept it off the roots for it to be a more low maintenance “rooty” look. I did a long layer haircut technique and added lots of texture to the ends of the hair as well as within the haircut. The hair was styled with a 1.25″ curling iron, leaving the ends out to ensure a messy tousled look. One of my favorite things about this look is the dimension the hair has when blending the two colors with her natural base. 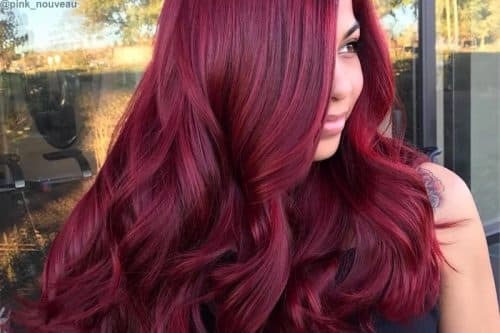 This look would be great for someone wanting to experiment with red tones but doesn’t necessarily want to commit to the high maintenance of overall red hair color. It would require using a color safe shampoo and conditioner, as reds tend to fade quickly when not properly taken care of. 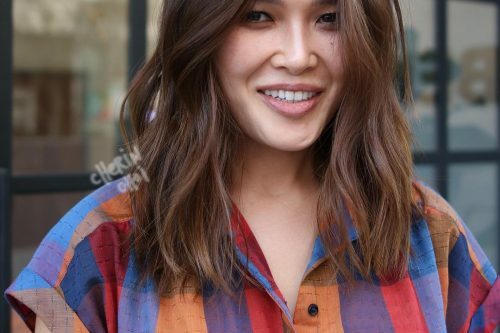 The haircut and style are great for anyone that wants an easy low maintenance look, as it is more of an “undone tousled” look that requires less time when styling. 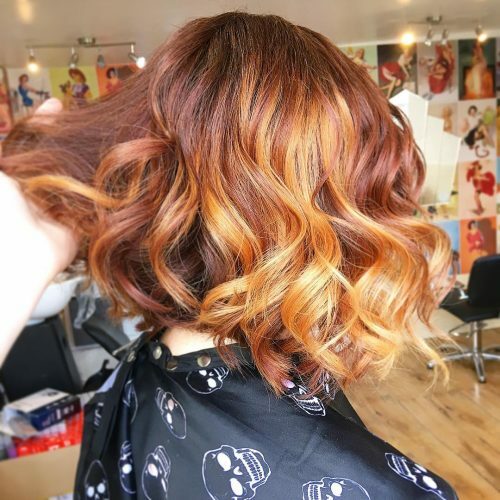 If you’re adventurous, try on this fiery color and look bold with any hairstyle you wear with those glamorous natural curls! This shade looks more vibrant and flattering for warm skin tones. 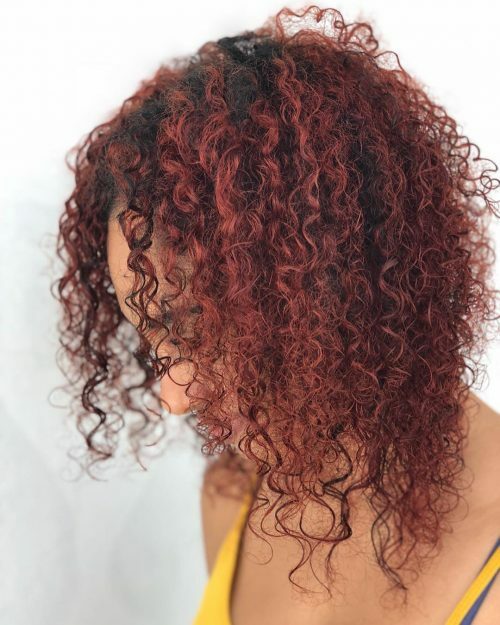 This look is an auburn red copper curly style. She wanted a change and this was just what she was looking for. I would call this a rooted auburn color. I styled her curly because her natural curl was to die for and she wore it curly all the time. It was fun because she gave me total freedom with cut and color. Red is fun but if you like to change your hair color a lot then it might not be for you. It is very important you have a thorough consultation with your stylist to make sure this is the right look for you. I styled her with L’anza styling cream and color lock and Design.ME’s #fabme for the leave in. If you want to achieve this style, you must have naturally curly hair and you must dry it with a diffuser to reduce frizz. Do not brush your curls while dry. Only do it when your hair is wet. Dry it section by section working up the head thoroughly, drying a section before moving on to the next. Add some red touches to your long and wavy brunette hair for that effortless natural highlight effect. These stand-out strands also offer volume and lightness at the same time. This is a deep auburn tone with copper highlights. 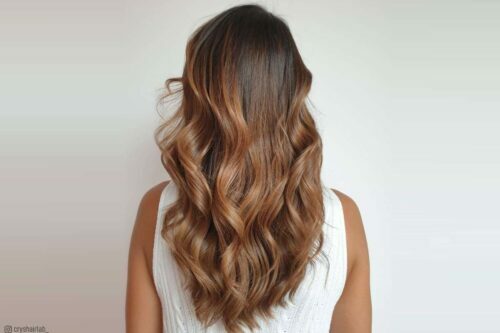 Because her hair is so long, a wavy style keeps your eye moving across the lengthy copper and auburn waves. The tones are just bright enough that others will question whether it’s natural or colored. Some red tones will complement pinky skin tones, though I find deep auburn colors to complement olive skin tones. I recommend holding a swatch to your face and compare the different reds to your skin tone. Also, try the swatches in different lighting. I feel there is a red out there for everyone! What can go wrong with merging honey lights together with auburn hair? Absolutely nothing! 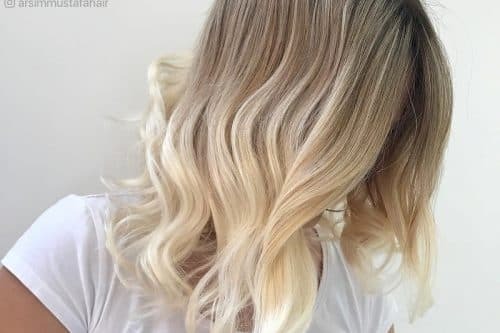 Amazing how this technique naturally brings volume and life to any hair. 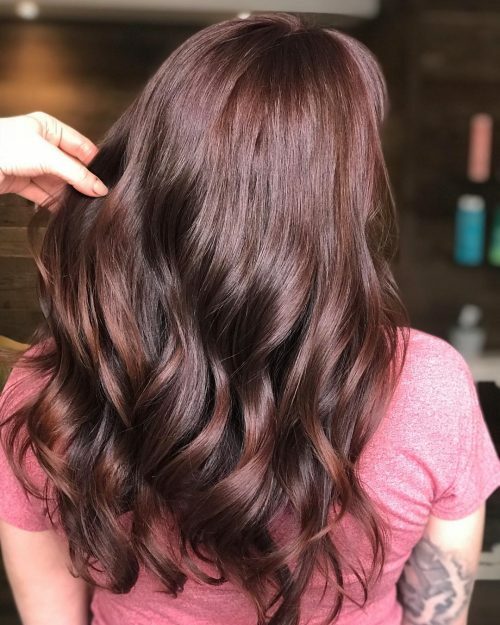 This color is a natural auburn red with a little flare. 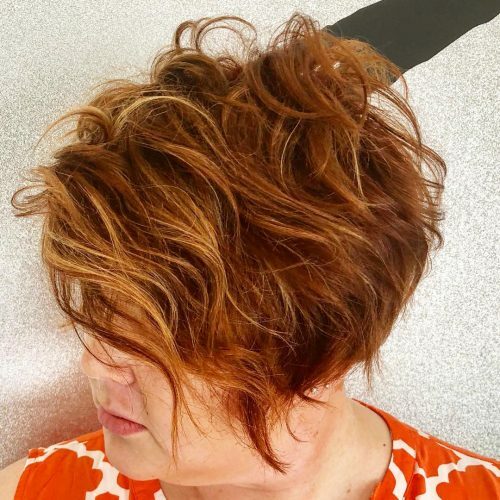 This is a great way to have fun with texture on a shorter haircut. We popped some teasy lites around her face for some added brightness for spring. I would suggest a good texture spray like IGK Beachclub for this style to create that separation and movement. This is a very wearable style for people with a round, oval, or heart-shaped face. Auburn looks fantastic for people that have blue or brown eyes. 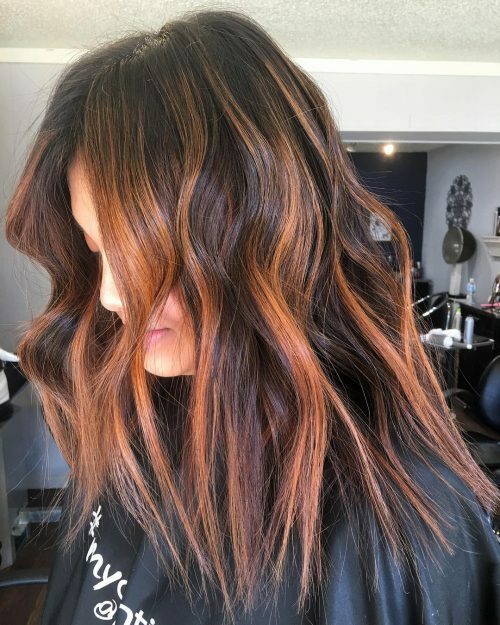 This auburn brown hair color is dimensional and a warmer, more fun alternative to blonde or even caramel highlights for girls who are naturally darker. It is subtle enough for the office, but still bold and edgy. My favorite thing about it is the seamless blend between the levels of lightness and that the tones tie the look together for an overall seamless blend with tons of dimension. I would recommend Davines All in One Milk to prep the hair. It provides hydration, thermal protection, and a bit of frizz control. I would also use Oribe Supershine Moisturizing Hair Cream to help seal the cuticle and add shine for the blowout. 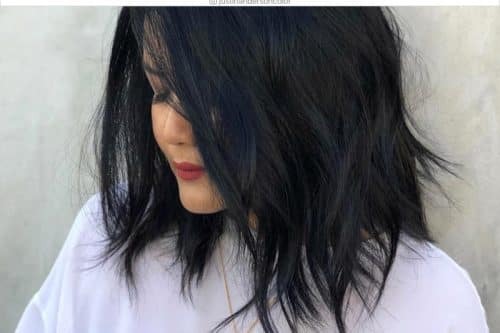 This look can work on any hair type (though there is more styling involved for more textured hair), and works best with medium to dark brown, or even black hair. It looks best on neutral, olive, and darker skin tones. Stay away from it if you have any red undertones. To recreate this look, start by highlighting, formulating to leave warmth in the hair to keep depth and not over lighten. I used a balayage technique for a more seamless dimension. 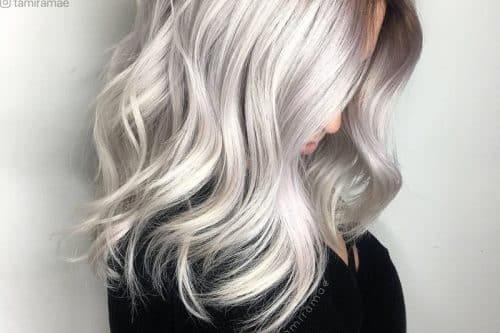 If you need to cover grey hair, start with with the base color and allow it to process, rinse and dry before beginning your highlights. Allow for lightest pieces to frame the face and simply dust the mid shaft to ends. Gloss the hair with a demi-permanant color. I use Redken Shades EQ equal parts 09AA, 06AA, and 05RV. Leave on five to ten minutes. Finish the look with long layers and face framing layers for an extra kick. This look is very low maintenance. 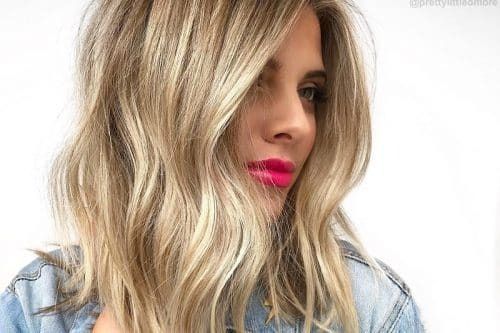 Aside from root touch ups (if they need it), it only requires maintenance every 10-12 weeks to refresh the gloss and move up the highlights as needed. This is a soft auburn, which by definition is in the red-brown family. 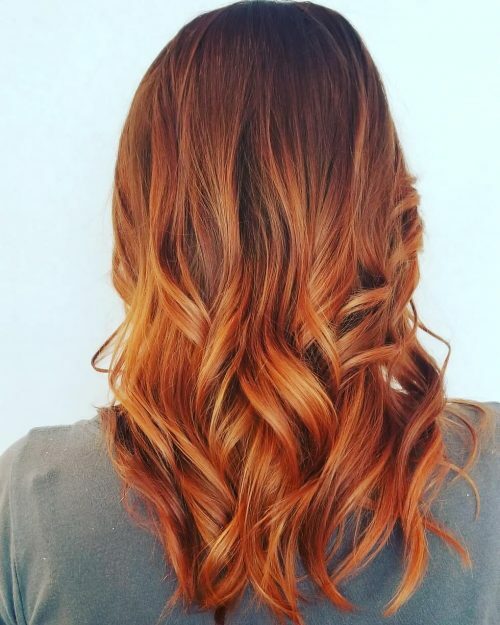 It’s not an extreme red, but it definitely has the warm undertones with a hint of copper and red that peak through in the highlights. My favorite part about this is just that — the subtle hints that leave you questioning what color your eye is actually catching. Red tones do tend to fade faster than others, so I always recommend using a color conserving shampoo and conditioner such as L’Oréal Professionel’s Vitamino Color line. For styling I also used all L’Oréal Professionel Products. I suggest using a leave-in cream like Mythic Oil Creme Universelle on the ends. It is great for smoothing and nourishment on dry or frizz-prone ends, yet light enough that it won’t weigh the hair down or leave it feeling greasy. For added volume I use their Techni Art Volume Envy mousse in the crown and I always finish with a light spray of Extreme Lacquer. This color combo is pretty versatile as it still keeps the darker tones around the face and is only accented throughout the mid shaft and ends with the subtle auburn. It is suited best for light to medium skin tones, but could work on darker tones as well. As for the cut and style, this particular client has medium density hair with a good about of wave and texture to it. Curls love holding on to hair with some texture. My advice is to always use professional salon products, This will help is preserving the color as well as the integrity of your hair. Also, always use your fingers or a brush to loosen your curls up once they have cooled. This is ESSENTIAL. 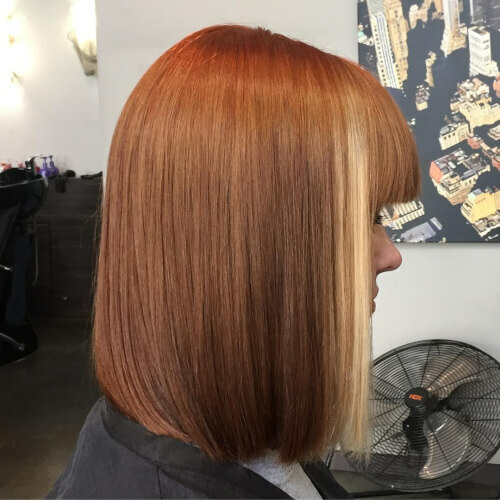 This look is fresh, streamlined warm tones intermixed with deeper auburn hues. 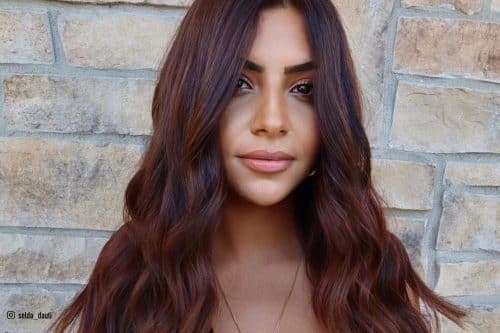 My favorite thing about it is how versatile the color is and how it can be a great option for someone who may want to experiment with warm, auburn tones without being or feeling too shocking. 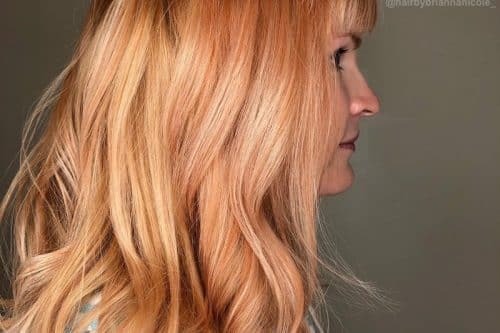 It’s soft, dimensional, and scratches the color “itch” for any woman who has been wanting an auburn hue. I styled the entire head with smoothing and frizz-fighting products. My favorite (and the products I used here) is R+Co Park Ave blowout balm mixed with a dollop of R+Co Tinsel smoothing oil. I blowdried with a boar bristle brush (or Mason Pearson brush) for extra sheen. 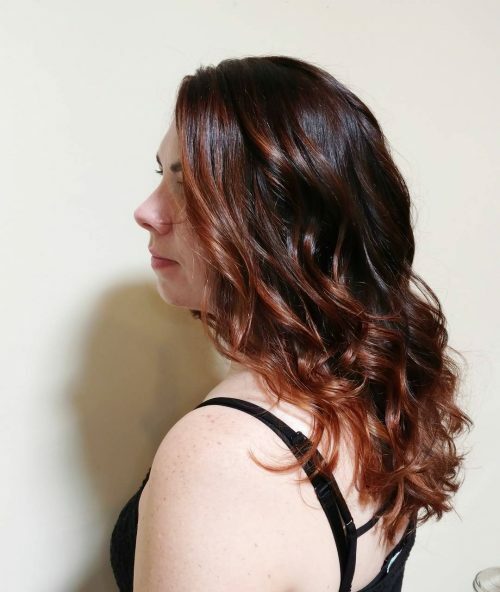 I finished with a little curling iron to give it a subtle wave, then sprayed with R+Co Foil which is a frizz and static spray that helps to add movement and shine on finished styles. I would say cooler skin tones wear this shade best. My client featured here is a naturally light blonde! She has ice-blue eyes and cool skin. 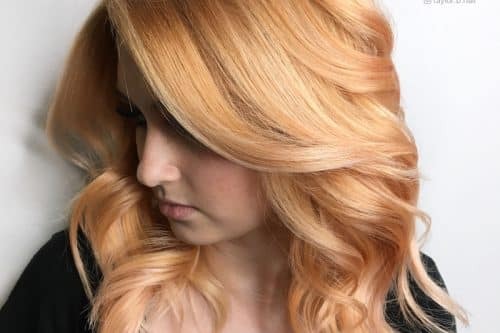 The auburn appears warm visually, yet there’s a lot of cool tones and deeper lowlights that have a cool hue to them to balance the warmer tones everywhere, and that’s what gives this finished look such a multi-dimensional tone. I love mixing cool and warm auburn tones when I’m coloring someone this hue. It makes it look more natural and prevents the color from turning brassy over time. She has to see me every two weeks for a fresh glaze (so important) and she needs to wash her hair very infrequently. This color fades easily, so not shampooing and coming in for frequent glazes will help in the long run. Using moisturizing shampoos and conditioners, as well as the styling products mentioned above, will help her to maintain the smooth look/style. This color is a bright auburn, inspired by Ana from Frozen. 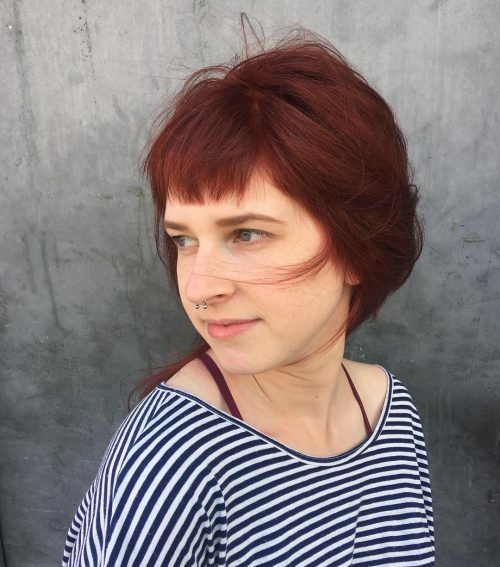 My favorite thing is that the client is not a natural redhead. I love creating reds that look natural on someone who’s not naturally a redhead! I used Wella Color Touch for this look. Fair skin always looks great with this tone and any hair type can pull off the style, but I think confidence is key for pulling off any look. A salon quality color-safe shampoo and conditioner is a must to maintain this color. There are some tinted shampoos with red hues in them that you can use, just be careful it doesn’t shift you into a cherry red. If you want your color to last you have to invest in quality products at home. Shampoo as infrequently as you feel comfortable, and find a good dry shampoo that you love and make it your best friend. Always condition after shampooing. The trick to a good conditioning is to ring your hair out before you put conditioner on and only put conditioner on from the ears DOWN, your roots don’t need the conditioner as much as the ends. 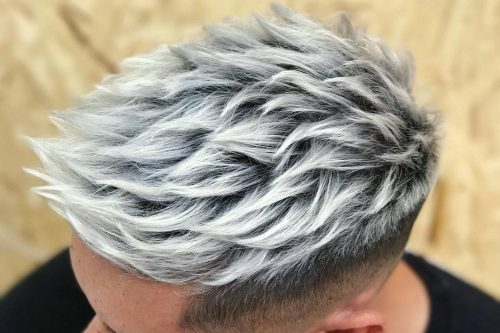 Bring pictures when communicating to a stylist what you’re looking for. 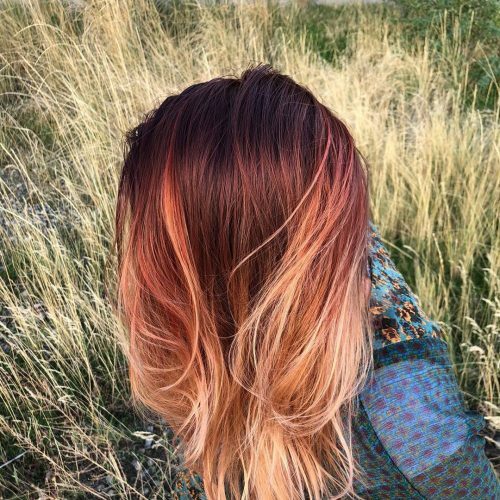 Auburn, copper and ginger can all mean different things to different stylists. Your stylist should be able to go over the photos with you once you’re in the salon. Anyone can pull off this hot short bob with choppy fringe with the proper attitude! This cut suits square and oval faces gorgeously.